On Sunday afternoon, on the way from Saint Brendan’s Church in Tarbert, Co Kerry, to Rathkeale for confirmations in Holy Trinity Church, Rathkeale [18 June 2017], two of us stopped for lunch in the village of Shanagolden, nestled in green-and-gold pastureland and basking in the warm summer sunshine. Shanagolden (Seanghualainn, ‘Old Shoulder’) is on the R521 road between Foynes and Newcastlewest, and has a population of about 300 people. Despite its size, Shanagolden has a long wide main street and a broad square, with the former shops set well back. The streetscape of the village is marked by the chimneystack of the former creamery, the tower of the former Church of Ireland parish church, and the Spring Rice Cross. Shanagolden claims to be one of the oldest recorded settlements in Ireland. A mile north of Shanagolden, Knockpatrick, said to be the highest land in Co Limerick. On the summit are the remains of an old church said to have been consecrated by Saint Patrick. Saint Patrick’s ‘chair’ in a neighbouring field consisted of five rude unhewn stones. A nearby well, dedicated to Saint Patrick. It is said that on a clear day there are views from the hill that stretch as far as Tipperary, Galway, Cork, Kerry and Clare, and that Limerick and Ennis can be seen from here. In 1207, Bishop Donat O’Brien of Limerick, granted the church in Shanagolden to O’Melinus, Chantor of Saint Mary’s Cathedral, Limerick. About a mile south of Shanagolden, on the road towards Ardagh, Shanid Castle was once one of the most impregnable castles belonging to the FitzGeralds, Earls of Desmond. Shanid Castle is a tower castle dating from the 13th century. It sits high on a hill with a motte some 35 ft deep. This impressive stronghold boasted circular walls 10 ft thick, with motte and bailey defensives, ditches and banks. Maurice FitzGerald was granted lands in Limerick by Richard de Clare (Strongbow) after the Norman invasions of 1169. Thomas Fitzmaurice inherited the lands of Shanid. He is said to have built Shanid Castle in 1230, although there are indications it was built before that date. Thomas Fitzmaurice was the ancestor of the FitzGeralds, Earls of Desmond, and Shanid Castle is said to have been the first stronghold of the Knights of Glin. These Desmond Geraldines went on to build many castles, but Shanid was the strongest. Shanid Abu (or Shanid Aboo), meaning ‘Shanid Forever’ in old Irish, became the war-cry and motto of the Earls of Desmond and Knights of Glin. The historian Begley records that in 1480, Gerald de Geraldinis took control of both the churches at Robertstown and Shanagolden. When the last Earl of Desmond was murdered in Kerry in 1584, the lands of the Desmond Geraldines were divided, and Shanagolden village was laid out during the 1580s as a plantation village. Shanid Castle was still inhabited until 1641, when it was finally burned and destroyed. One of the earliest recorded nunneries in Ireland, the ‘Old Abbey’ or Saint Katherine’s Abbey, was founded as an Augustinian nunnery in 1298 in a valley about two miles east of Shanagolden. It was dissolved in 1541 with the suppression of the monastic houses at the Reformation. This tower is the only surviving part of the former Church of Ireland church. The living was a rectory and vicarage. The rectory formed the corps of the precentorship of Limerick and the vicarage was in the patronage of the Precentor. The tithes amounted to £200, one-third payable to the vicar and the remainder to the precentor. The old church was a large and old building. By the early 19th century, the chancel was in ruins, but in 1815 the nave was rebuilt and reroofed with a lofty square tower, with a loan of £450 from Board of First Fruits. The Ecclesiastical Commissioners also granted £101 for its repair. Two years earlier, in 1813, the glebehouse was built with a gift of £400 and a loan of £232 from the Board of First Fruits in 1813. The Revd George Vincent (1772-1850) lived at Shanagolden House, while J Fitzgerald lived at the glebe-house, about a mile from the church. The church closed around 1956, and all that remains is the ruined and neglected tower, where pointed arch openings and limestone sills can still be seen, as well as the pinnacles and crenellations to the roof. The graveyard has many early and well-crafted tombs and headstones, with carved limestone gravestones and carved limestone table-tombs. There is a barrel-vaulted mausoleum to the south, belonging to the Langford family, with a flight of limestone steps to the entrance. By the early 19th century, Shanagolden and much of the surrounding lands belonged to Thomas Spring Rice (1790-1866), Chancellor of the Exchequer and later 1st Lord Monteagle, who lived about three miles away at Mount Trenchard. The Hon Stephen Edmond Spring Rice was the eldest son and heir of Thomas Spring Rice (1849-1926), 2nd Lord Monteagle, and his tragic, early death complicated the succession to the family estates and titles. The monument has been described ‘as one of the last monuments to landlords to be erected in Ireland.’ It is finely carved with high quality lettering, interlace and relief sculpture that are typical of the skills of early 20th century craftsmanship. Today, the literary merit of his poetry is questioned by many. He also produced what he claimed were translations from Turkish, Persian, Arabic, and Irish. But he was also known for literary hoaxes, and some of his ‘translations’ are in fact his own work. I spent Saturday in Glenstal Abbey at the Ministry Day with bishops, priests and readers from the dioceses of Limerick, Killaloe and Ardfert and Tuam, Killala and Achonry, in a full day of discussions about how we can resource and develop ministry throughout these two neighbouring dioceses. Glenstal is known for the school that is run by the Benedictine monks of Glenstal Abbey, on the edges of the Co Limerick village of Murroe. But Glenstal is also an important building architecturally and as a quiet place of spiritual rest and retreat. The Norman Revivalist castle at Glenstal was designed by the English architect William Bardwell (1795-1890) and was built in 1839 for the Limerick philanthropist and entrepreneur, Sir Matthew Barrington (1788-1861). The castle has a great gate and a massive drum tower that resembles the one at Windsor Castle. On the top of the tower is a Latin inscription, Bardwell me fecit 1839, ‘Bardwell made me 1839.’ Bardwell gained celebrity status in 1835 by submitting a Norman-style proposal for rebuilding the Houses of Parliament in Westminster. To emphasise that this castle is in the Norman Revivalist style, and to boost the Barrington family’s claims to royal descent and noble lineage, the figures on each side of the main entrance represent King Henry II of England and Normandy, and his wife, Eleanor of Aquitaine. 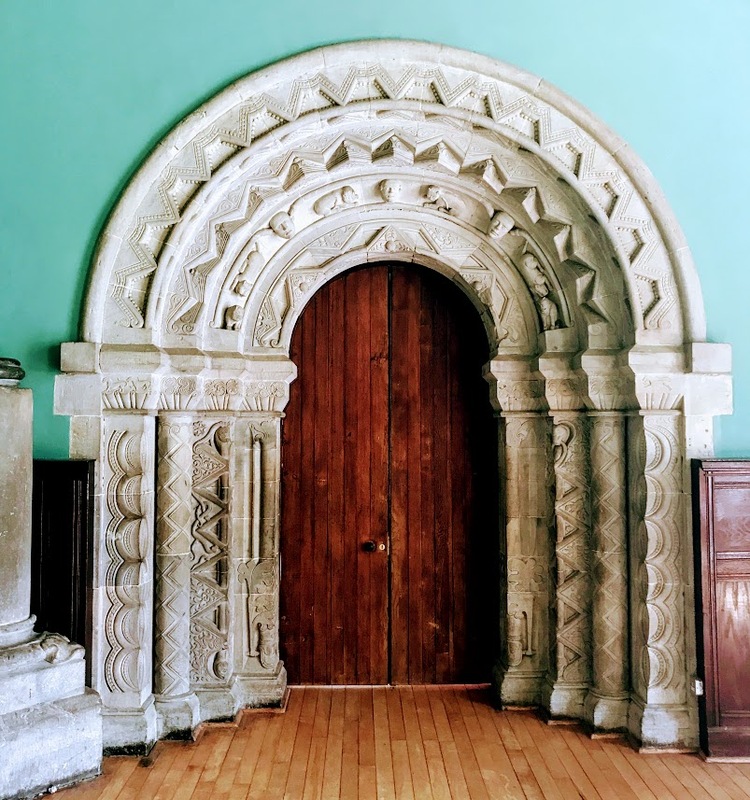 Bardwell’s design is a unique mixture of architectural features, combining the mediaeval past of Ireland and England, with Anglo-Norman and Irish Romanesque influences, and inside there are highly unusual decorative carvings in the Irish Romanesque style. An elaborate Romanesque doorway is a copy of the portal inside Killaloe Cathedral, Co Clare was created. A painting in the castle by Martin Cregan and dating from 1830, shows the Barrington family preparing plans for Barrington’s Hospital in Limerick. The plaque over the hospital door credits Joseph with its establishment, but his son Matthew was the driving force behind the project. Joseph Barrington is standing and pointing to Matthew Barrington, second from the left, recognising his elder son’s major role in the venture and acknowledging him as the future head of the family. The gardens include the Lady Garden, named after Sir Matthew’s wife, Charlotte, the chapel lake and bridge built in 1860 by the engineer William Le Fanu (1816-11894), and the 17th century Italian-style terraced walled garden, laid out between 1679 and 1681 and reshaped by the Barrington family. In 1925, Sir Matthew Barrington’s grandson, Sir Charles Barrington, offered Glenstal Castle to the Irish Free State as an official residence for any future head of state. The offer was considered seriously, and WT Cosgrave carried out what he called ‘an exhaustive survey’ of the castle. However, the vice-regal lodge in the Phoenix Park, now Áras an Uachtaráin, was chosen instead, and when Sir Charles and Lady Barrington left Ireland permanently in 1925, the castle and estate were bought by Monsignor James Ryan for a mere £2,000. 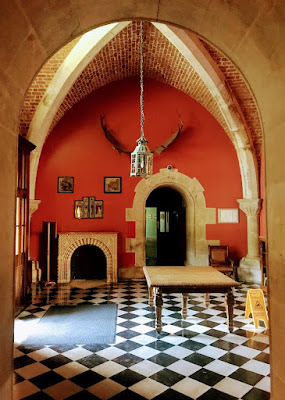 Some months after he bought the castle, Monsignor Ryan wrote to Celestine Golenvaux, the Abbot of the Benedictine Abbey at Maredsous in Belgium, and invited him to come to Ireland and set up a daughter house in Glenstal. By March 1927, the first two Belgian monks had arrived at Glenstal to establish a new house. In September 1932, the monks opened a new secondary school with Father Columba Skerret as Headmaster, and an initial intake of seven schoolboys. In 1957, Glenstal became an abbey, dedicated to Saint Joseph and Saint Columba. Glenstal Abbey is a working abbey known for its simple but warm hospitality, with spiritual guidance available to all visitors. The abbey church was designed by Father Sebastian Braun, an architect and a monk of Maredsous. The foundation stone of the abbey church was laid on 14 October 1951 by Archbishop Jeremiah Kinnane of Cashel, who opened and blessed the church on 24 June 1956. The church includes some of the work of Brother Benedict Tutty (1924-1996) of Glenstal, including the cross over the altar, the Stations of the Cross and the tabernacle. The stained-glass windows in the Blessed Sacrament Chapel are the work of Patrick Pye. I made a point of spending part of the day in the icon chapel in the crypt of the main church. This Russo-Byzantine style chapel houses the abbey’s collection of Russian and Greek icons. This is a unique sacred space and it is a reminder that monasticism has its roots in the Christian East. This chapel, designed by the architect Jeremy Williams, is in the traditional Byzantine style. It takes the shape of a cross in a square with a central circle surmounted by a dome. The altar, in traditional Orthodox fashion, is in a small apse accessed through the ‘royal doors.’ Beneath the dome, in painted glass, the artist James Scanlon has depicted the four figures representing the four Gospel writers. The abbey follows a daily monastic routine of Matins and Lauds in the morning, the Community Mass at mid-day, Vespers in the evening, and Compline at the end of the day. In recent years, the monks of Glenstal Abbey have become known for books such as the Glenstal Book of Icons and the Glenstal Book of Prayer, and for their recordings of Gregorian chant and liturgical music. There was time too for a quiet time in the gardens, with the magnificent arboretum with ancient specimen trees, one of the few remaining parts of the primeval forest that once covered Ireland. Before I left, I spent some time in the Abbey gift shop, buying some books and some cards with icon prints.